Every so often I get to show my work to others. Secret Life of Stones will be traveling with Quilt National 2017 for the next few years. If you have a chance to see it glance at the back where you will find this little surprise — the back story. Chaos Ensues, and four other pieces are showing at the World of Threads festival Oct - Dec, 2018 in Oakville, Ontario. My show at the Dixon Gallery and Gardens museum in Memphis, TN opened in January 2018 and continues to March 31, 2018. I hosted two workshops and did an artist talk at the museum. They were gracious and supportive of my art. It was a great opportunity. The Along the Horizon show opened on January 16 at the Reece Museum at East Tennessee State University in Johnson City Tennessee. The works were all by Memphis artists. I was honored to be included. I am profiled in the exquisite double issue of Fiber Art Now magazine. It's a beautiful edition that reveals this year's winners of the Excellence in Fibers Exhibition. Great news. Round and Round It Goes has been chosen Best in Show in the Fiber Art Now exhibition, Excellence in Fibers, 2015. As part of the exhibition it will be featured in the winter issue of the magazine. I am proud to be part of a this exciting collection of artwork. 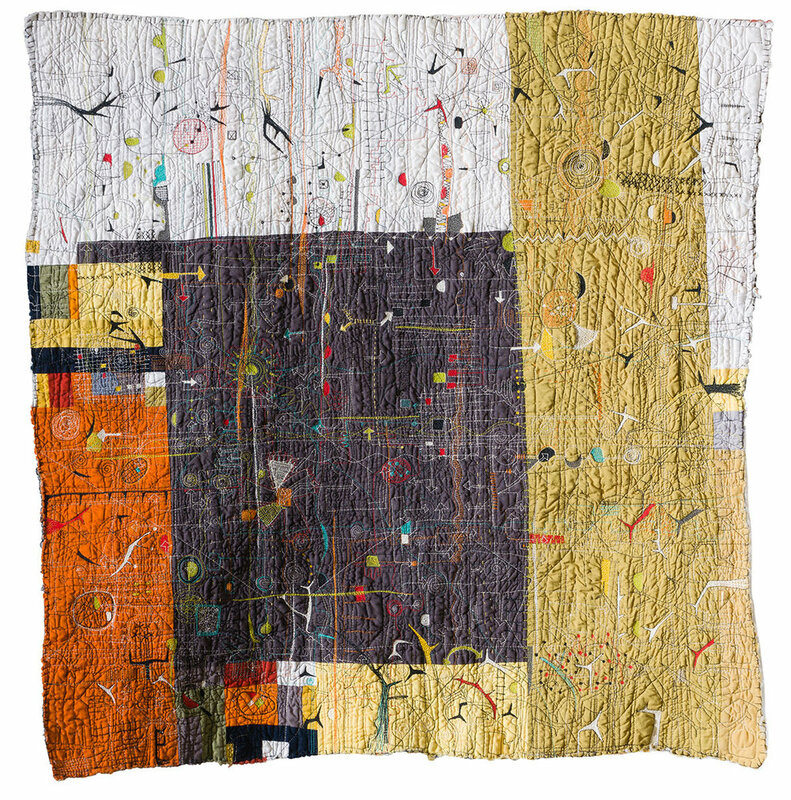 Martha Sielman's beautiful book Art Quilts International: Abstract & Geometric, is out. There is a four page spread about my art in it. That's Pat Pauly's quilt on the front! What a gift! There is a Masterworks exhibit planned for 2017-2020 in which my piece Round and Round It Goes will travel. The Summer 2016 issue of Art Quilting Studio has a feature article about my work. Some of my favorite artists are also featured including Mary Pal, Deidre Adams, Pamela Allen and more. The issue is packed full of inspiring work. Order your copy here. I am profiled in the Summer 2015 issue of American Craft magazine. A huge honor. Stream of Consequences will move to Erie Museum of Art, Erie, PA, January 20, 2017 through June 11, 2017 with the SAQA Earth Stories exhibit. The exhibit celebrates the stories of people or projects that enhance the planet, make a significant difference in restoring and/or protecting the environment, increase sustainability and otherwise improve the earth we all occupy. My piece is dedicated to the Wolf River Conservancy in Memphis, Tennessee. Join me at Arrowmont for a 5-day workshop (July 31 - Aug. 6, 2016) focused on free-motion quilting. Pollinators is in the 58th Annual Delta Exhibition at the Arkansas Arts Center in Little Rock, Arkansas, June 9 through August 28, 2016. The exhibition reflects the region’s strong traditions of craftsmanship and observation, combined with innovative use of materials and an experimental approach to subject matter. Pollinators received an honorable mention in the show. This year a total of 1038 pieces were sent in by 457 artists, and ultimately, 52 were chosen from 30 artists.